I was idly sketching patrons at one of my usual haunts (a local coffee shop) and reflecting on the human condition (specifically the blessings bestowed by a lack of self-awareness). My thoughts were prompted by the couple I was sketching. 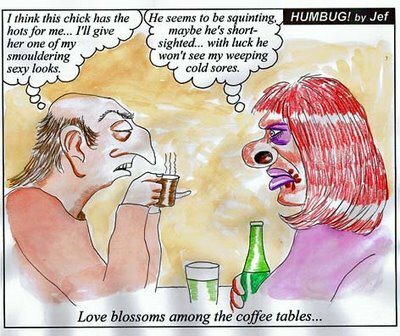 They were a singularly ill-favoured pair (the cartoon is based on my sketch) and yet they were animated, flirting and obviously engrossed in each other. I made notes for a possible caption, and was about to put my sketchbook away, when to my horror, the couple rose and walked towards me. They looked over my shoulder at the sketch, and wondered aloud where I got my ideas for my cartoons. I quickly gained my self-composure and told a white lie. I said that the drawings of people were purely from my imagination, but that I hung out at a coffee lounge sketching in order to get general cartoon ideas, and background layouts. They looked about at the other customers to assess my bona fides, and clearly satisfied that I had not been drawing anyone present, they departed with a cheery wave. After this narrow escape, I pondered once again the blessings bestowed by a lack of self-awareness. There would be no living in society without it.